For 15 years Maria Devane has been desperately, passionately in love with Dante Romano. But every month, Dante shifts shape, becoming a wild animal. During those times, he wanders far and wide, leaving Maria alone. Since the beginning, she has kept his secret, knowing that their love is worth the danger. But when a string of brutal attacks occur in local parks during the times when Dante is in animal form, Maria is forced to consider whether the lies she's been telling about her life have turned into lies she's telling herself. 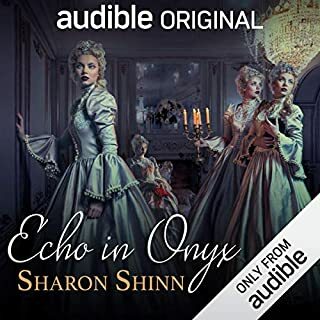 ©1997 Sharon Shinn (P)2009 Audible, Inc. I would not listen to criticisms of the narrator. I delayed buying this book because of reviews. I know now to take those reviews with a grain of salt. The narrator reads the story with a sort of simple style as if one was reading from scripture. So it grates on some because it sounds as if she needs practice. Her voices of characters are good and if you listen, her style is perfect for the story. The story is a little Taming of the Shrew like but with the backdrop of faith. I enjoyed the story and the narration, skillfully done. There's so much to love about this book. Fantastic world building, sweeping descriptions... Archangel really transports you to another world. But much as I enjoyed the world, at a certain point, I kept wondering why it wouldn't end already. This is mostly the fault of Rachel, a stubborn, self-centered, sanctimonious woman who thinks she's right about everything and expects everyone to do what she wants them to, even when she doesn't say what she wants. Her character is well developed - just extremely unlikable. She whines and yells and complains and doesn't do anything but think about what she wants. The most ridiculous is when she complains about how the world is wrong, and yet, given the chance to change the world as the archangel's de facto queen, all she does is run away with a clan of nomads. Suffice it to say, I hate her. But not enough to trash the entire book, because, like I said, there really is a lot to love about it. Gabriel, the soon-to-be archangel who was betrothed to Rachel by divine will, inexplicably still loves her despite all her ridiculousness. He's not entirely likable either, being arrogant and somewhat bad-tempered at times, but his noble goals with regard to the world he's about to inherit as archangel are admirable. He reminds me a bit of the Beast in Disney's Beauty and the Beast - surly but ultimately kind-hearted. His love-hate relationship with Rachel doesn't quite work for me, since I picked up on all of the frustration and none of passion (which was supposedly there, but buried beneath layers of irritating fights). Anyway, despite Rachel, the world-building and the side characters are enough to merit four stars, in my opinion. The universe Sharon Shinn created really is mesmerizing, and I'm tempted to read the sequels even though if I have to put up with any more of Rachel's selfishness, I might start banging my head against the wall. 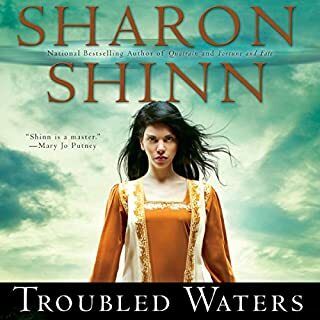 It was only by chance I read this first installment of Sharon Shinn's "Samaria" trilogy (#1 Archangel, #2 Jovah's Angel, #3 The Alleluia Files) about 10 years ago. I picked it up at a tag sale among the 5/$1 paperbacks, and to my surprise, it joined my list of all-time favorite books. Jovah's Angel is also excellent, and is a necessary sequel because it explains the mysteries of Jovah and the hierarchy of life on Samaria. I thought The Alleluia Files was just OK, and subsequent books in the series seemed like overkill (I never went beyond book 4). 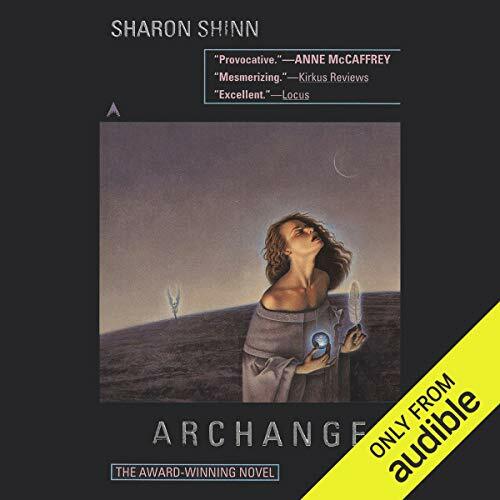 I was dubious about getting the audio version of Archangel both because I know the story and its outcome so well and because I feared bad narration might "spoil" this longtime favorite for me. Despite what others have written about Tamara Marston's performance, however, I truly enjoyed her presentation and loved the book all over again. It is true that the main characters are self-centered and perhaps not instantly lovable, but they are courageous and honorable and I enjoyed watching their deepening love and humanity unfold as their adventures heated up. The villains are one-dimensionally villainous, but great foils for the heroics, and the book's climax is memorable. It may not rank as great literature, but Archangel presents a unique and thought-provoking "alternate world," as well as an ultimately heart-warming romance. 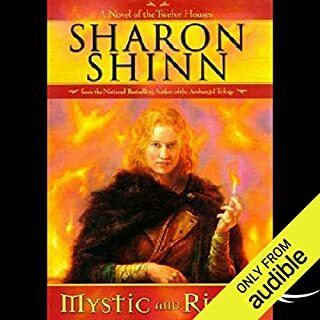 I loved this book and in fact the whole series, so much so that I listen to it often while waiting for my monthly credits to come. I find after listening to the whole series that I miss the characters. If you want to escape from reality for a bit this is the series to get. I wish Ms. Shinn would expand the series. I do find that the series jumps around a bit but if you get them all you can listen to them in the order of time in the story and not the order released. By this I mean that Angel Seeker which is her last book in the series actually takes place at the end of Gabriel's (Archangel) rein. I'm looking forward to Ms Shinn's other books! 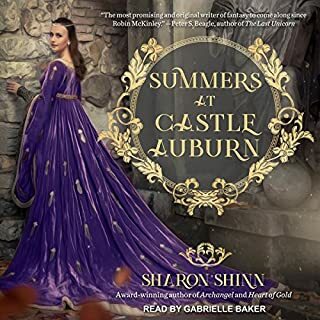 This is the first book I've read in the Samaria series, but not the first book I've read by Sharon Shinn. I've also read Troubled Waters, and I think I might like that series better, as it develops. In Archangel, Shinn takes a new angle on the angel/fantasy genre by including elements of science and technology, and structuring the story around a romance between an archangel and a human, so her approach to the story was unique. I took an interest in the characters and stuck with the book all the way through, but I wouldn't call it a favorite. I am another huge fan of Sharon Shinn?? ?s books. 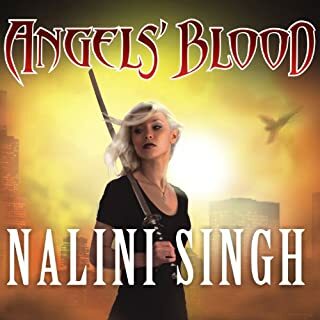 I was thrilled to see that the Archangel books had come out on Audible! Unfortunately, the narrator leaves much to be desired; but the story is so enjoyable that I forget that I don?? ?t like the way she reads until someone ???speaks??? with a twang. Oh well, I will overlook it and get all of the books as they are some of my all-time favorites. Now, how about ?? ?Summers at Castle Auburn??? [read well]? I read several reviews on this book before purchasing it, so my expectations for the world building were very high. Shinn did build a creditable world by twisting biblical facts and references around. Okay, I get that and it was clever, but the Bible is full of hope and what Shinn created negated that. I would have preferred to spend my money listening to an author who created a unique world out of their own imagination. I didn't enjoy Pride and Prejudice and Zombies either. It would have also helped if I had liked the main characters, but the heroine's contrariness for the sake of being contrary got old really fast. I didn't like that the hero and heroine's problems all stemmed from their refusal to confide in each other. After the first BIG misunderstanding, you'd think they'd learn to talk to each other so that the BIGGER and BIGGEST misunderstandings didn't happen. But, no, it was too much to ask of these characters, even though she was already 25 and he was older. If they were in their teens, maybe, but . . . I'm always looking for a good fantasy. This just didn't do it for me. I have owned this entire series for years and have read and re-read, enjoying it thoroughly. It is not the sort of story that would appeal to everyone, but the concept is intriguing. However -- The narrator is not great. She's not incapable. Personally, I find that American female voices just really don't have what it takes. The production value is good. She reads clearly and concisely, perhaps a bit too much so. At first I was concerned that she did not have the ability to convey the male characters. Not very far into the book I realized that it was not the male characters, nor the main female characters, that would be the problem. She read every minor female character with voice characteristics that simply made me want to reach into my MP3 player and throttle them all! Hence, I give it three stars. The reader didn't put me off the book. Even though I know how it ends, I still will listen to the finish. And I'll probably listen to the next in the series as well. This book seemed interesting but it lacked creativity and excitement. I kept listening thinking something big would happen eventually, but it never came. Have read the book and it's always been a favorite that I could read over time and again. First time listening to an audio book and have to say it took a while to get used to. Narrator at times sounded a little cheesy but still worth a listen!